“Mobile first” has become a go-to-market business mantra as smart phone usage continues to rise, and offering customers mobile options that seamlessly integrate with multiple channels is a vital piece of your digital transformation puzzle. Understanding when and how customers are using mobile solutions is critical to leveraging this channel to simplify and improve the customer experience. When your customers have a great experience, they become your most loyal customers and advocates. 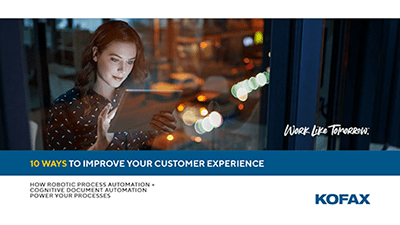 Kofax Analytics for Mobile™ is an integrated analytics platform for the Kofax Mobile Capture™ SDK, Kofax Mobile ID™, Kofax Mobile Deposit Capture™ and Kofax Mobile Bill Pay frameworks that’s designed to deliver instant visibility into product performance, feature adoption and usage. Monitor trends, pinpoint problems quickly and gain valuable insight into your mobile capture solutions. Adoption rates and stickiness are critical to the long-term success of mobile apps. Out-of-the-box dashboards using the technology of Kofax Insight, an enterprise-class analytics platform used by many top global financial institutions, measure the effectiveness of your mobile solutions and help you create a continuous feedback loop to stop problems in their tracks and ensure that your mobile solutions are performing to customer expectations. A single, unified solution allows you to achieve in-depth visibility and understanding of how your mobile software is performing and complying not just within the system, but in the processes around it. With analytics dashboards available for SDK, Bill Pay, Mobile ID and Deposit Capture server frameworks, this single, integrated and flexible analytics solution enables you to start with one product module and easily add others when you deploy new solutions.